Carmel’s Matt Moretti catches touchdown pass from Ryan Shilling as he crosses into end zone during Carmel’s loss to Mount Vernon Saturday. 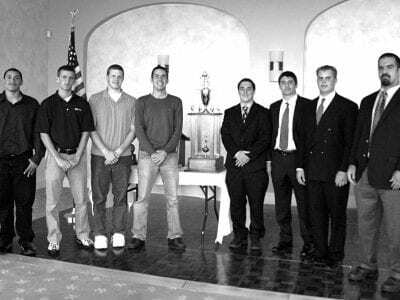 CARMEL—For several years now, area football coaches have been looking for that magic formula…. Please login below or purchase a subscription to the Putnam County Courier to access this content. Carmel’s Joe Ilardi had two goals in win over Mount Vernon and a goal against Carmel last week. CARMEL—After spoiling Mahopac’s chance to tie for a league title and ripping Mount Vernon in an out-bracket game, the Carmel High boys s… Please login below or purchase a subscription to the Putnam County Courier to access this content. 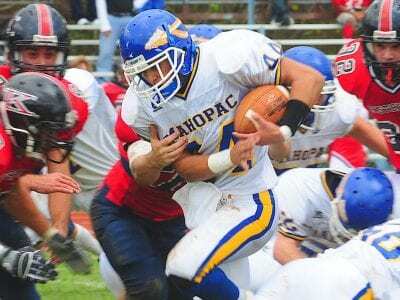 Mahopac’s Tom Viento (44) carries the rock for the Indians in a loss Saturday at RCK. MAHOPAC—Consistency. It’s been a problem for the Mahopac High football team throughout the season, and Saturday it reared its ugly head again. T… Please login below or purchase a subscription to the Putnam County Courier to access this content. CARMEL—Longtime Carmel High tennis standout Marielle Campbell will be making her first trip to states, after an impressive winning performance on Monday earned her the No. 3 seed in the section. At Veteran’s Park in Ardsley, Campbell, … Please login below or purchase a subscription to the Putnam County Courier to access this content. MAHOPAC—After playing a strong regular season, and earning the school’s first home playoff game in some time, this was not the ending the Mahopac High boys soccer team was hoping for. The eighth-seeded Indians dropped a 1-0 decision to… Please login below or purchase a subscription to the Putnam County Courier to access this content. BREWSTER—Two big plays in the first quarter by the Pirates put a damper on the season finale for the Brewster High football team Friday night, as Pearl River rode the early lead to a 16-6 non-playoff victory at Brewster High School. The Pira… Please login below or purchase a subscription to the Putnam County Courier to access this content. Mike Thomas and Charlie Carr placed 2-3 at the Northern County Championships. 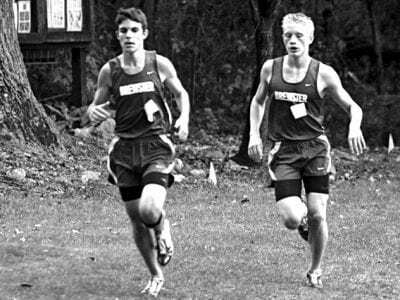 PHOTO SUBMITTED BREWSTER—Mike Thomas finished second and Charlie Carr followed in third Saturday, leading the Brewster High boys cross country team to a second place … Please login below or purchase a subscription to the Putnam County Courier to access this content. 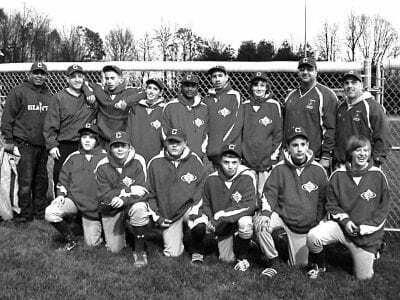 They played Bedford on Sunday, November 1, 2009 and lost 6 – 0.Pictured in the photo (L-R): Front Row: Tim Earl, Sebastian Russo, Joe Burns, Tom Shofi, Mike Palmiero, Cody Nery; Back Row: Steve Sookdeo (Asst. Coach), Rich Monahan (Coach/Manager), Bra… Please login below or purchase a subscription to the Putnam County Courier to access this content. Mahopac football captains (right) welcome their counterparts from Carmel to last week’s Lake Mahopac Club Rotary luncheon to break bread together. The Mahopac-Carmel competition exists not only on the football gridiron, but also when it comes … Please login below or purchase a subscription to the Putnam County Courier to access this content.